Nintendo announced that the pantaloon-wearing candy clown Lola Pop will be Arms’ newest fighter today. She’s got a totally bonkers (and hilarious) outfit more fitting a psychedelic first birthday party than hand-to-hand combat, and looks marvelous. 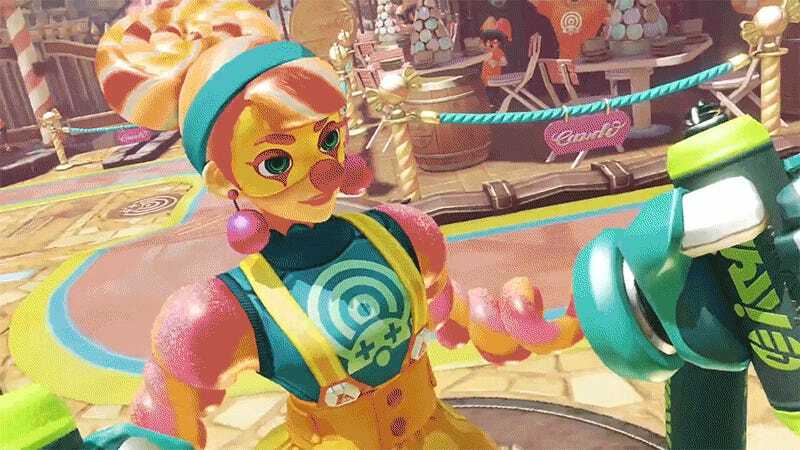 Following Arms’ trend of eccentric character designs, Nintendo explains that she’s a “a well-traveled clown with a personality as colorful as her clothing.” It seems like Lola Pop’s inflatable body and sets of blocking arms— swirling nunchucks and large nets—will make her a more defensive fighter than what we’ve seen so far. Her stage, a sort of lollipop-themed piazza, has been teased for a few weeks now. After the offense-focused Max Brass, Arms’ last DLC character who released last month, Lola Pop is sure to add a new layer of play to the game. Lola Pop will release with Arms’ version three update, which doesn’t have a set date yet. But for those who want to test out the game, which Kotaku called “polished and addictive” but also a “one-trick pony,” Arms is offering free play this weekend for Switch-owners who don’t have Arms.